I Don’t Share with Mice! My friend had an encounter with a furry rodent! Yuck! I really don’t like mice, not even small ones. I was working just hours ago when a mouse invaded my workspace. I have a comfy rocking chair with a rocking ottoman. My laptop and I love that I can put my feet up when I’m tired and have work to edit or pages to write. I sat down when a fresh glass of tea, prepared to finish edits on Cheerleader Dad to send to my editor. I had put the glass on a table to my right. Now I want to finish my fairy-timetravel-highlander book! Sunday, June 21st, is the summer solstice, better known as the first day of summer. It is also known as Midsummer’s Eve or the Wiccan celebration of Litha. I thought it would be interesting to share some of the ancient customs of this night. 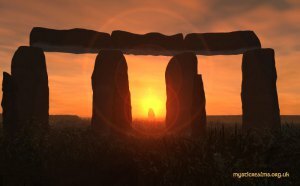 The summer solstice is the longest day of the year in the Northern hemisphere. If Stonehenge is anything to go by, summer celebrations have a millennia-old history. While the ancient druids may have commemorated the fertility of the season, many of us are just happy to get outdoors after a long winter.